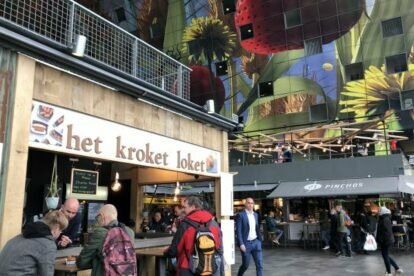 Het kroket loket is located in Rotterdam’s beautiful Markthal. Now I am not saying the Dutch are the only nationality with croquettes, but ours are distinctly different. Traditionally filled with meat ragout, they are a favourite Dutch snack, as are their mini spin-offs bitterballen. Het kroket loket has stepped it up a few notches by creating croquettes this Dutchie never dreamt of. Traditionally served with mustard, het kroket loket has developed a mayonnaise to accompany the variation of croquettes so you have the best foodie experience possible. The traditional meat croquette is delicious, there is no doubt about it, but live a little. The cheese croquette combines the typical Dutch snack with our world-renowned cheese. Served with truffle mayonnaise it is pure heaven. For those looking for more of a kick, the rendang croquette paired with a chili mayonnaise will warm you up. The Peking duck croquette dipped in the paprika mayonnaise is different in a good way. The true close-my-eyes-and-enjoy-this-snack moment for me is the tomato mozzarella pesto croquette served with a basil mayonnaise. Italy-meets-the-Netherlands fusion deliciousness. Every month there is a speciality croquette which to date has not disappointed. Some combinations raise an eyebrow, but I have learned to go with the flow, as you will finish your croquette with a smile on your face. There is a 6-piece mini croquette sampler. Stay or take away, these croquettes will make your day.